Create the look of blood splatter as part of a bloody Halloween costume, special effects for film and television, or moulage/triage practices. This pump bottle will create the look of blood that has been splattered about. 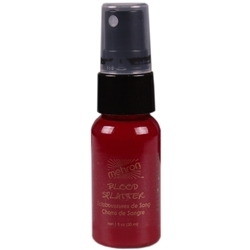 The blood splatter spray is available in a 1 oz. container with a lid to help prevent accidental spillage. The consistency of this blood is thinner than that of traditional stage blood.